The Southeastern islands of Bali, Indonesia, are splendid for diving, surfing, exploration and just relaxing. These three islands sit some 15 km off the southeastern coast of Bali. The Badung Strait separates the islands from Bali. All three feature white sand beaches and wonderfully crystal clear waters. Nusa Lembongan is by far the best known by visitors and has a well developed level of tourism-related infrastructure within its eight square kilometres or so. This is a popular surfing location with three highly rated breaks, has some lovely beaches and coves and a range of accommodation to suit all budgets. Nusa Ceningan is a tiny island where few people stay but it is easily reached via a suspension bridge from Nusa Lembongan. Has a well regarded surf break and is a fun place to explore. Nusa Penida is huge in comparison to the other two at more than 200 square kilometres. It is though a wild and untamed island in every imaginable way and has very little in the way of tourist facilities. This is an island of stunning natural rugged beauty and tourist development plans have been rumoured and mooted to no effect for many years now. Currently, Nusa Penida is best known as a world class diving destination. The only realistic way (although you can charter a helicopter) to reach these islands from Bali is by boat. There are several options according to budget and speed. It is straightforward to reach Nusa Lembongan and visitors to Nusa Penida usually come via Nusa Lembongan, although direct services from Bali are available. All services involve getting your feet wet as there are no jetties to speak of. Nusa Ceningan is reached on foot or by bike via the suspension bridge that connects it and Nusa Lembongan. From South Bali there are boat services to Nusa Lembongan, departing from Sanur Beach and Benoa Harbour. 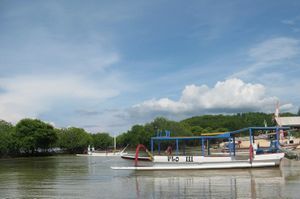 More information about the boat services is in the main Nusa Lembongan article. Regular public ferry services run to Nusa Lembongan from Padang Bai and Kusamba but these are unreliable, get very crowded and have a poor safety record. Not recommended. It is possible to take regular public ferries to Nusa Penida direct from Sanur, Kusamba or Padang Bai in East Bali, but this is difficult. The services are very sketchy, sometimes over-loaded and cannot be recommended for safety reasons. You are able to charter speedboats to get into either Nusa Lembongan or Nusa Penida from Sanur or Padang Bai. Expect to pay about Rp 1,000,000 each way. Contact the speedboat operators or make enquiries in person at the relevant point of departure one day in advance. Renting a motorcycle is a practical option and widely available on Nusa Lembongan. Expect to pay between Rp 70,000 and 100,000 per day. Nusa Lembongan and Nusa Ceningan lend themselves very well to walking. Bicycles are also a good option and can be rented at many outlets on Nusa Lembongan. Keen cyclists may like to bring their own mountain bike in with them. There are no taxis on any of the three islands but locals will be keen to offer you rides in the back of truck for a nominal fare. There are a few bemos on Nusa Penida mostly plying the north coast road between Toyapakeh and Sampalan. A motorbike is essential for exploring Nusa Penida and can be rented when you arrive in Toyapakeh or Sampalan. Some visitors from Nusa Lembongan arrive with rented pushbikes - make sure you get permission to take the bike off Nusa Lembongan first. You should note that roads in Nusa Penida are rough and in remote areas no more than stone-strewn tracks. Nusa Ceningan is easily reached from Nusa Lembongan reached via the (slightly rickety) suspension bridge. The bridge allows traffic by foot, bicycle and motorbike. 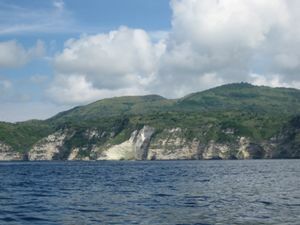 There is no scheduled way to get between Nusa Ceningan and Nusa Penida but a charter boat might be possible. Public boats depart daily at 6AM close to the suspension bridge between Nusa Lembongan and Nusa Ceningan and run to Toyapakeh or Buyuk Harbour near Sampalan in northern Nusa Penida. There are also services from the Jungut Batu area of Nusa Lembongan to Nusa Penida. All of these can be a little 'worrying' at times and are often very crowded. Charter boats are available, departing from and arriving at the same area as the public boats. If you are staying on Nusa Lembongan, ask at your hotel. If not, go to the shoreline close to the suspension bridge or to the beach at Jungut Batu and ask around amongst the boatmen. Rates certainly vary but expect to pay around Rp 300,000 one way. The story is similar in reverse for the return journey. 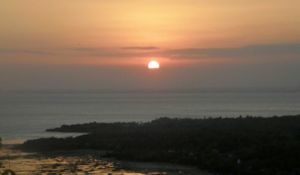 Sunsets over Bali are not to be missed. Any west-facing spot will do the trick but amongst the best are Jungut Batu beach on Nusa Lembongan, the ridge of high ground which runs the length of Nusa Ceningan and the highest point of Nusa Penida, Puncak Mundi. On a good day, the reflection on the ocean combines with the sun dropping magically behind Bali to create a truly breathtaking scene. Nusa Lembongan hosts several really attractive and unspoilt hidden white sand beaches and coves. Dream Beach and Sunset Beach in the south west are especially recommended. You can easily spend a whole day at either as they both have small beach-side restaurants. Neither beach is suitable for swimming though. The headland of Devil's Tear separates these two beaches and is a great spot to see the crashing waves of the Indian Ocean. The whole southern coast of Nusa Penida has spectacular, high white limestone cliffs which will simply take your breath away. 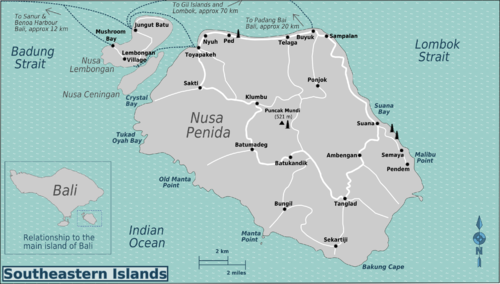 Even by the standards of Nusa Penida, the southern quarter is remote and inaccessible. The roads are difficult and in places distinctly hairy. But once you get there it will all seem worthwhile. Try anywhere along the south coast between Pendem and Batumadeg. Goa Karang Sari is a large limestone cave on the east coast of Nusa Penida about 4 kilometres north of Suana village. Find a local to help guide you and bring a flashlight. There are some impressive stalactites and other typical limestone formations. The entrance is a stiff climb from the road level. Of great religious and cultural significance. Seaweed farming is a well-established micro industry here and areas around all three islands are planted and harvested. The seaweed is mostly destined for the north Asian cosmetics market. The best place to see this in action is the estuarine channel between Nusa Lembongan and Nusa Ceningan. Nusa Penida is best known as a world class diving destination. The rich waters around the three islands support no less than 247 species of coral, 562 species of fish and Green and Olive Ridley Turtles. Many dive operators based in Bali and neighbouring Nusa Lembongan offer specific dive trips to Nusa Penida. Special attractions include fabulous, huge Mola Mola (Oceanic Sunfish) in season and large Manta Rays year round. Mola Mola are migratory fish and most likely from July to October although sightings are reported all year round. There is diving available here for beginners but most of the dives require a decent level of experience. If you are not a diver, there are excellent snorkeling spots including Mushroom Bay and the northern mangroves on Nusa Lembongan and Crystal Bay on Nusa Penida. Nusa Lembongan is well known as a surfing destination and there are three breaks here: Playgrounds, Shipwrecks and Lacerations. All three lie off the east coast and there is a thriving surf scene in Jungut Batu. The waves are good if sometimes a little crowded. 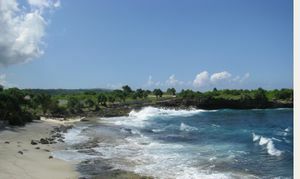 There is also a break of the south coast of Nusa Ceningan known as the Ceningan Break. There is a substantial mangrove forest around the north coast of Nusa Lembongan and Nusa Ceningan totalling some 210 hectares. This is best explored in a traditional outrigger boat called a jukung which can be hired with a captain on the day. This combines well with some snorkeling which is good just offshore from the mangroves. Nusa Lembongan offers a choice of eating options restaurants ranging from street-side push carts serving local noodles and soup to fine dining in an elegant resort. Locally caught seafood is especially recommended and you will not be short of options in the Jungut Batu and Mushroom Bay areas. Options are much thinner on the ground in Nusa Penida with a few local warungs on the north coast and very little elsewhere. Jungut Batu has a well established surf scene and there are a few waterfront bars there worth checking out. Expect very cold beer, Australian sports and lots of surfie talk. A small but growing monthly full moon party takes place on the beach north of Jungut batu (Blue Corner Beach) in Lembongan. Virtually all of the accommodation is on Nusa Lembongan with just a handful of very simple home-stays on Nusa Penida and one solitary bed and breakfast on Nusa Ceningan. This tends to be budget and the lower end of the mid-range category, but there are a few luxury options and more scheduled to appear soon. Direct speedboat transfer to the Gili Islands, Lombok is an interesting option. Back to Sanur in Bali. This page was last edited on 23 June 2017, at 07:53.